Associate Professor Yoshihiro Takeshita (Faculty of Education) and co-authors received the Best Paper Award 2017 from the Volcanological Society of Japan. 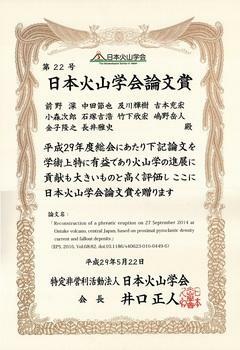 This paper award is awarded to authors of volcanologically original and excellent thesis published in the magazine "Bulletin of the Volcanological Society of Japan" or "Earth, Planets and Space". On 22nd May, an award ceremony was held at the JpGU-AGU Joint Meeting 2017 jointly hosted by Japan Geoscience Union and American Geophysical Union (venue: Makuhari Messe International Conference Hall). Reconstruction of a phreatic eruption on 27 September 2014 at Ontake volcano, central Japan, based on proximal pyroclastic density current and fallout deposits. It is one of the research achievements that many research institutes collaborated on Ontake volcano in 2014 that caused many victims of the eruption. We succeeded in restoring the complex eruption transition in detail by analyzing many eruption images in addition to the geological survey near the crater. This result is important not only in the study of phreatic eruption but also in terms of volcanic disaster prevention, we can expect development of similar eruption research in other volcanoes.